Don’t let storage become the weak link. When client machines wait for storage systems to input and output data, it delays workflows and negatively impacts productivity. With the Panasas® ActiveStor® Solution, data flows directly from our storage nodes to the application. There are no hops through intermediate computers or even extra network links. Isn’t it time your business realizes faster time to results? With the ActiveStor Solution, performance scales seamlessly. Our scale-out architecture grows storage capacity, DRAM caching, and network bandwidth incrementally and linearly as you add more ActiveStor enclosures. Simply add more shelves and configure them to accelerate small file input/output (I/O), large file streaming, or a mix of workloads. Automatic load balancing optimizes performance and eliminates performance hot spots. The ActiveStor Solution directly connects all storage consumers to all storage nodes in the cluster, boosting performance and availability while eliminating hot spots. It separates metadata access from the data path to avoid congestion. 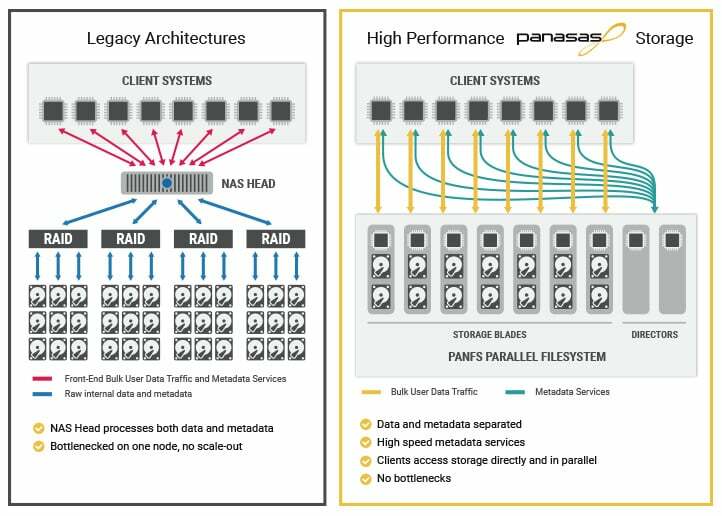 To maximize throughput and scalability, the Panasas PanFS® operating environment distributes data across a pool of storage nodes for complete direct parallel access. Multiple user authentication schemes and access protocols control data access permissions for smooth integration into Linux, macOS, and Windows environments. Clients requiring the highest performance access the PanFS architecture via the Panasas DirectFlow® parallel data protocol. Open access to the same namespace occurs through Network Files System (NFS) and Server Message Block (SMB)/Common Internet File System (CIFS) protocols.